Walking your dog is a fun thing to do. But many of us worry about encountering an unfriendly dog. What if the dog was to attack? What would you do? How would you effectively and safely stop the situation; stopping the dog attack. We all love our dogs and wouldn’t want them to get hurt in anyway. It’s our job to love and protect them. Dogfights can be pretty gruesome and heart-wrenching. You feel powerless because you don’t know how to safely break it up. Not to mention the expensive vet bills. What can you do? You can’t control the other dogs that are left to roam the streets without leashes or those with irresponsible owners. And being a true dog lover, you don’t want to harm the attacking dog either. You just want to stop the attack as quick and safely as possible. The easiest answer…stop it before it starts. I know, that’s a loaded question, but being aware of your surroundings and possible threats really is the best approach when walking your dog. Preventing an attack is all fine and dandy – but what do you do, when one has already started? That’s a great question! We’ll cover that in the section below. The short answer – you need to either scare or disable the attacking dog long enough to safely get away. Avoiding the possible attack isn’t always possible – especially if the dog is roaming the streets unleashed and has seen you and is coming straight for you! However, if you can see a potential problem up ahead and can change your walking route or get out of the dog park, etc. that is a great solution. How do you scare an attacking dog? That’s an easy one – create an extremely loud noise. This distraction and ear piercing noise will show the dog that you are the “alpha” a.k.a the boss and it better not mess with you! This sound should be more than banging a stick on the ground or yelling – my recommendation is “dry firing” a stun gun. This truly is your best option – it creates a sound like a lightening bolt, a bright light, and can be heard and seen from a distance. The perfect combination of what is needed. Sometimes even with the best intentions the unthinkable happens and a wild dog attacks your precious pup. It’s happened to me…and it is a horrible experience. The dog attack can start and then escalate into an extremely dangerous situation very quickly! When this happens we don’t want to kill or permanently hurt the other dog – all you want is to get away safely and stop the attack! The only reliable solution is a stun gun or stun baton. These self defense devices will disable the attacking dog without causing permanent damage and won’t cause any harm or problem for you. How Does a Stun Baton or Stun Gun Help? For preventing dog attacks it is perfect because it can create a sound like a bolt of lightening, makes an extremely bright light, and can be heard and seen from a far distance. This is absolutely ideal for showing another dog that you are the boss and that it should not come any closer. It is what you need on every walk. If you and your dog actually get into a dog attack a stun baton is the perfect protection as it gives you the stun power to shock the attacking dog into submission. The most important part is that the stun baton will only cause the dog to be temporarily paralyzed – it does no permanent damage or harm to the dog. Simply gives you enough time to get away. What Stun Gun and Stun Baton Should You Use? We have an extensive selection of stun batons and stun guns, but below are the ones that we have tested and found that these are absolutely perfect for preventing and stopping dog attacks. Many animal control departments across the country purchase this 18" stun baton for dog control. They like the fact that it is 18 inches long which gives them some distance from the attacking dog. Also, the high voltage helps immobilize the dog faster. The use of a stun baton causes no permanent harm to the attacking dog (when used responsibly). 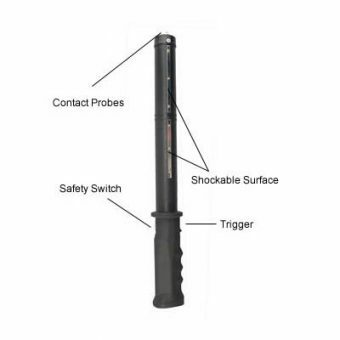 This 18 inch stun baton also has a shockable surface extending 8.5 inches down from the tip on either side of the unit. This unique feature will stop the attacking dog when you are unable to use the tip of the baton by just applying the side of the unit to the dog's body. When you test fire this stun baton, it makes a loud cracking noise. Our customers have also discovered that this loud noise is often enough to stop and scare the dog away. Our customers like this unit because it is so easy to carry but yet so powerful. It is a little longer then 3" and over 1,000,000 Volts. Even though the voltage is so high, it causes no permanent damage to the attacking dog. The high voltage means it can immobilize the attacking dog faster. The Guard Dog Hornet is so small that it will literally fit inside a cigarette box. When you are walking your dog, you already have a leash and a "poo" bag with you. Carrying an additional large device can be difficult. 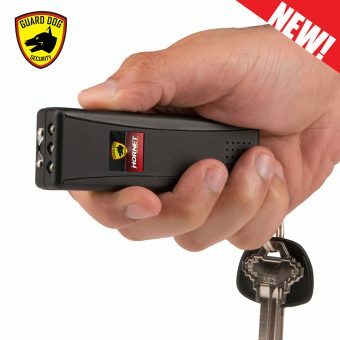 You can easily carry this small stun gun in your pocket or on your key chain. A high voltage mini stun gun makes a loud cracking noise when you test fire it. Our customers have also discovered that this loud noise is often enough to stop and scare the dog away. Exactly what is needed for preventing a dog attack. TASER Pulse is by far the most effective product for stopping a dog fight/dog attack. It is safe and easy to use. It causes no permanent harm to the attacking dog. It is the only product which will give you a maximum of 15 feet shooting range. This keeps you at a safe distance from the attacking dog. Pull the trigger and the TASER will shoot two small probes up to 15 feet away from the target. It delivers a powerful signal that completely overrides the dog's central nervous system and directly controls their skeletal muscles. And that's how you can safely break up a dog fight or stop an attacking dog without causing injury or damage. The TASER Pulse even comes with a built-in laser sight to help you aim. 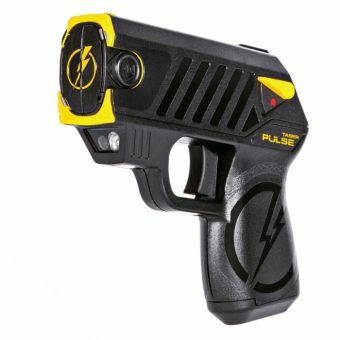 The TASER Pulse will also work as a contact stun gun for close distance use. Let's say you missed the attacking dog, all you need to do is unplug the air cartridge and hold the TASER against the dog's body. The take down power is just as effective. The Times Herald-Record on April 13th 2006 details the use of a TASER gun by a Monroe, NY police officer to subdue two attacking pit bulls on a golf course. The dogs which escaped from their home had been menacing golfers at the Monroe Country Club and golfers were left defending themselves using golf clubs. The officer zapped the dogs twice forcing the dogs to return home. The problem was solved and those involved were safe while the dogs had no damage done to them. Still unsure how to protect yourself? Check out our full collections at Best Stun Gun. This entry was posted in Self Protection. Bookmark the permalink.